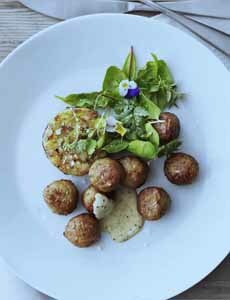  Chicken meatballs served with a vegetable patty and artistic salad, at Ikea. Meatballs stuffed with foie gras at Cheu Noodle Bar (photo courtesy Tina Wong | The Wandering Eater). Polpette de tonno, tuna meatballs. Here’s the recipe from Ricette Della Nonna. Keftedes, Greek meatballs. Here’s the recipe from Bowl of Delicious. Indian spices and pappadums make these meatballs special. Here’s the recipe from BBC Good Food. 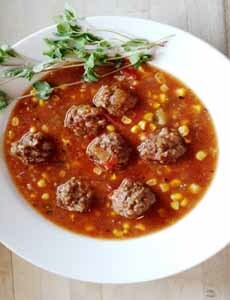 Albondigas, Mexican meatballs served in soup. Here’s the recipe from Fresh By Northwest. Yesterday we featured the first five of ten meatball trends. Today we finish the list. 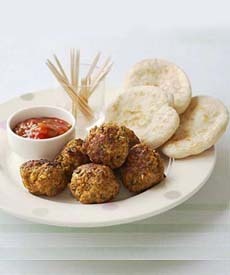 For health and sustainability, chicken (photo #1) and turkey meatballs have become popular over the last two decades. Duck meatballs have become the darlings of some chefs, who grind their own duck meat. If you don’t already serve poultry meatballs, expand your repertoire in traditional ways (with spaghetti, on heros) and new ones. Substitute chicken or turkey meatballs for the chicken breast in stir-fries, sweet-and-sour dishes, General Tso’s Chicken and other Asian-style recipes. Present chicken meatballs Buffalo-style. Roll them in hot sauce and serve with blue cheese dressing and celery and carrot sticks. Turkey meatballs mixed with onions, celery, and carrots; served with cranberry jelly and a traditional gravy at the Meatball Room, Boca Raton, Florida. Chicken meatballs seasoned with herbs and a hint of red pepper, sprinkled with Italian cheeses and served in a zesty marinara sauce at Olive Garden. Traditionally, meatballs have been a more economical way to enjoy meat. But you can reverse the situation by adding higher-end ingredients. 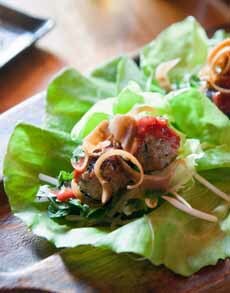 Create a luxe meatball stuffed with foie gras and minced truffles (photo #2). Make a “surf and turf” meatball stuffed with chopped lobster, shrimp or crab. Blend chopped chuck with pricer cuts, like brisket and short rib. Foie gras-stuffed meatballs with plum sauce at Cheu Noodle Bar in Philadelphia. Grilled beef meatballs with braised beet greens, sofrito and tomatoes, at Bestia in Los Angeles. Duck Meatballs alla Toscana filled with fontina, parmesan and provolone, porcini mushrooms, whipped ricotta, mascarpone and dried cherries, in a port wine and veal reduction, at Fresco by Scotto in New York City. 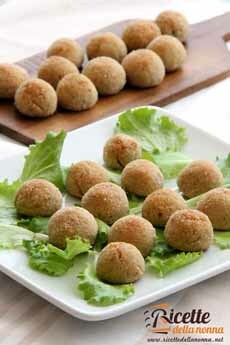 If fish or shellfish can be formed into burgers, patties or cakes, then they can be formed into meatballs. See what other cultures are doing with ground or minced seafood, such as French quenelles, Thai fish cakes, Chinese fish balls and Japanese take yaki (octopus balls). Ground fresh tuna and other meaty fish are especially adaptable to an Italian-style meatball, like Sicilian polpette di tonno (photo #3). Polpette di Pesce Spada: baked swordfish meatballs simmered in a spicy homemade tartar sauce. at Calabria Restaurant & Pizzeria, Livingston, N.J. Oyster Room Meatball Sub: pork-oyster meatballs, napa cabbage slaw, smoked oyster mayonnaise, ciabatta bread, at Boone’s Fish House & Oyster Room, Portland, Maine. You can find meatballs almost everywhere around the globe: kofte (Middle Eastern); bun cha (Vietnamese); frikadeller (Danish); bakso (Indonesian); klopsiki (Polish); kofta (Indian). 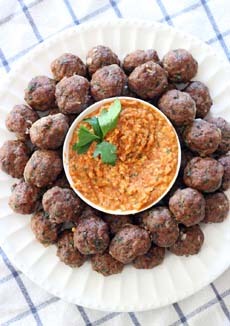 Go global with international recipes (photo #5), or just use the country’s signature spices in your own meatballs. Mix ground pork, grated Manchego and pimentón, and serve on a toothpick with a roasted piquillo pepper sauce or saffron aïoli. Turn your favorite global flavors—allspice, cumin, curry, harissa, garam masala, etc.—into meatball seasonings. Mexican albondigas with salsa verde, cotija, pine nut, fried egg and masa (corn) cake at Bar Amá in Los Angeles. Greek keftedes (photos #4 and #5), fried meatballs of ground beef and lamb with garlic, onions and mint, at Alchemy in San Diego. In 1969, Alka-Seltzer famously based a commercial on the line uttered by a man who had eaten a too-spicy meatball: “Mama mia, that’s a spicy meatball!” If you’re old enough to remember, you may still use that line, along with “Where’s the beef” and other classics. Add smoky heat to the ground meat or its sauce via chipotle in adobo sauce. Use an on-trend condiment such as sriracha or Korean gochujang to add heat to meatballs. Spicy ricotta meatballs: beef, veal and ricotta meatballs with red chiles and caramelized onions, at Romano’s Macaroni Grill, 30 locations nationwide. Chorizo meatballs, with roasted tomatoes, celery heart and onion, saffron with pecorino gratinée, at Soya & Pomodoro, Miami. Don’t forget to plan a meatball party to enjoy the whole group.